For a night under the African skies, head over to the lookout, an elevated thatched viewing deck with a double bed 4 metres away from a big 5 reserve. Nice! Common to all the room are fans, mozzie nets and quality linen. In keeping with an away-from-it-all bush holiday, there's thankfully no TV or internet. Out on the deck you’ve got a portable braai and a splash pool to cool off in. With Kruger’s Crocodile Bridge Gate a mere 20 kms away, heading into the park for your early morning or sundowner drive is a doddle. Nearby Lionspruit Reserve is also an option. And, for a bite out, there are a number of restaurants within Marloth Park itself. Simple, comfortable, private, good value, plenty of wildlife on your doorstep, glowing reviews, your fantasy real bush holiday is now one step closer to reality. Safari: As Marloth Park is on the fence to the Kruger National Park and only 21 kms from Crocodile Bridge Gate our guests are afforded awesome game viewing oppertunities. Romantic: The double bed on the look-out deck, with its thatched roof is perfect for romantic evenings under the stars. the light in the bathroom did not work and the door handle of the second bedroom was broken/kept falling off. The cabin is totally secluded and we fell asleep to lions roaring every night!This was a wonderful stay, which made it difficult to return to busy Johannesburg!True tranquility!!! 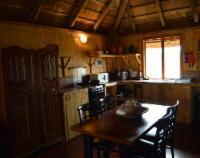 Lovely Bush cottage .Private and true bush experience. Lovely splash pool and day bed. Lion Tree Bush Lodge is 0.9km from the centre of Marloth Park , the nearest airport 77.1km (Kruger Mpumalanga International Airport).